Kerala HATS (Kerala Homestay and Tourism Society) and in association with State and Union Tourism Departments organized 2nd edition of Homestays and Rural Tourism Travel Meet 2017 will be held on September 15 to 17, 2017 at Bolgatty Convention Centre, Kochi, Kerala. 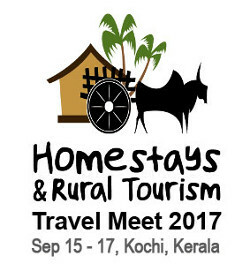 Homestays and Rural Tourism Travel Meet 2017 aims to provide a platform to understand the value and importance of homestays and Rural Tourism in Kerala. The B2B meet includes discussion on rural tourism sector and seminars.